Pests, rats, termites, the problem may look minuscule, but to the unwary home owner these issues often grow to be big after all. Dark and dingy attic and crawl spaces are home to all such problems. Neglecting these areas may cost you a fortune. Regular inspections and timely upgrading not only ensure optimal functionality of your property but also help you save heaps. Damaged property, costly repairs, inflated utility bills, serious health implications and repeated evacuations; the infestations may wreck you completely. Thus, seeking help at the right time and most importantly from the right person is a close call. 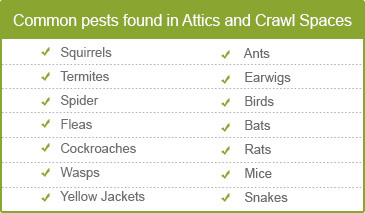 Quartz Solutions is ‘one-stop shop’ for all your attic and crawl related needs. Our experienced staff equipped with latest technology will inspect, monitor and up-grade the entire area in the most effective manner. Leaking ducts make attic and crawl spaces damp and humid. These conditions and perfect for mold and mildew to flourish causing severe property damage. Insects like wasps, fleas and roaches leave a trail of harmful germs that spread harmful diseases. Pests, white ants and termites eat into wood structure and furniture causing severe wood rot. Animals, like rats and mice ruin furnishings and upholstery. They run about unhindered and damage ducts, wire cables and much more. Cracked air ducts allow harmful gases to flow into the living areas. This impairs insulation capacity and fuels serious breathing troubles. Hygienic and properly kept attic spaces improve the overall efficiency and effectiveness of your property. A careful inspection thus goes a long way in maintaining your property. At Quartz Solutions, we believe in getting hold of the problem at the earliest. This not only controls the extent of damage but also helps you enjoy a good health – physically and financially. During our complimentary initial assessment we will check all interiors, test the area for harmful gases, and inspect for damaged parts. Based upon the requirements, the most viable plan to fix the problems will be charted out. 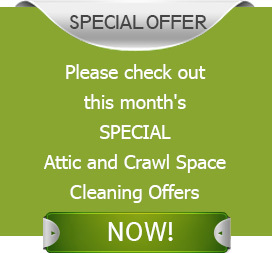 We, at Quartz Solutions, strive to provide premium attic and crawl cleaning services at the most competitive prices. Our tailor made plans will best suit your needs and pocket. Ridgefield Park is a small village in Bergen County, New Jersey. But despite its village status, the region and its inhabitants enjoy all the amenities to live a comfortable and stress free life. Let infestations not rob you off this privilege. Hire us to help you keep your property and vicinity is perfect and top notch condition. Our dedicated attic and crawl cleaning services will surely boost the effectiveness and efficacy of your property for years to come. Call Quartz Solutions 201-205-2042 and book your free attic inspection!